I think we have called her the princess since long before she was ever born. The night I was induced with her, the nurses kept coming in to wake me up when Grace wouldn't like the position I was laying in. It's safe to say that she's always had a mind of her own and wanted to do things her own way. Do you think I could wear that, Sunny? 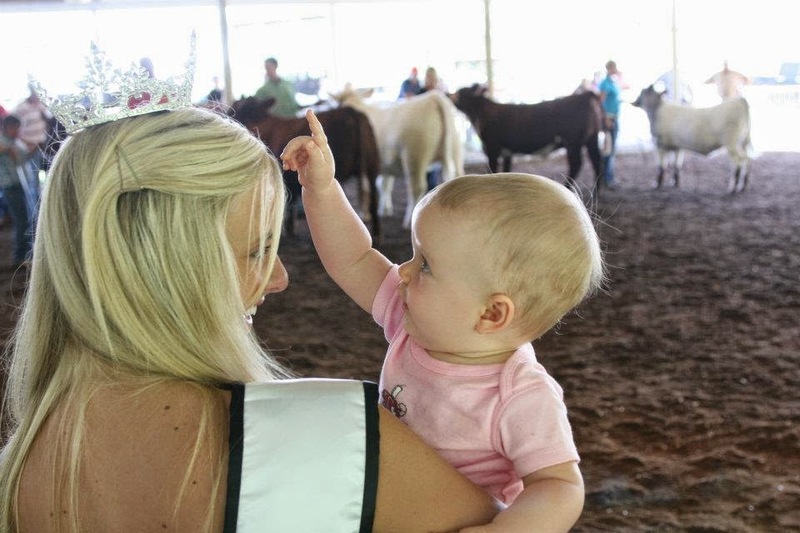 Grace managed to find her way into Queen Sunny's arms at the Montgomery County Fair in June 2012. It's kind of funny, but even as a newborn infant there were songs she wouldn't let you sing to her and books she wouldn't let you read to her. If it was a song I really wanted to sing, I did it anyway, but she always let me know what she really thought. Like I said, she's always been the princess. 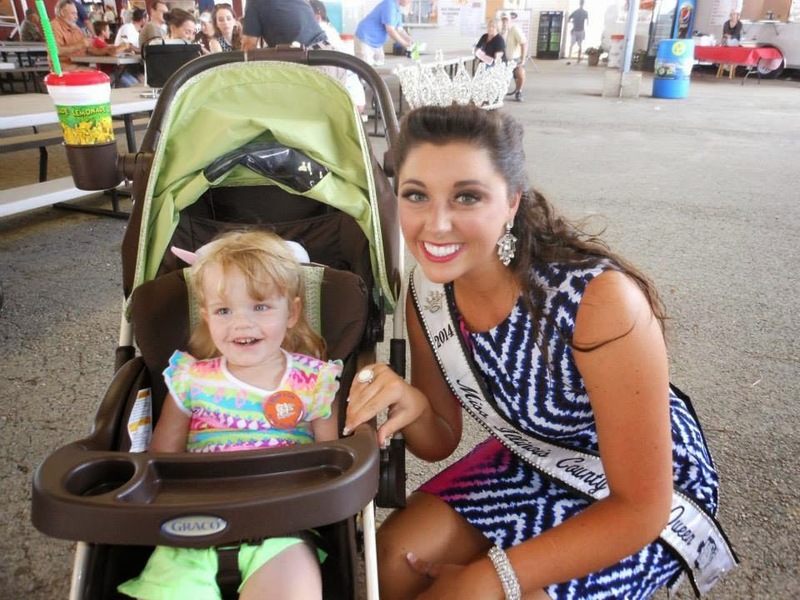 Our friend Queen Summer (Miss Illinois County Fair Queen) stopped to pose with Grace at the Illinois State Fair this past August. Since I've always loved dresses, Grace has always had more than one or two to wear. Her grandmas have been fond of shopping for dresses too. Although Grace may never tell me she likes playing dress up with me, I know she likes to be all dolled up. And she especially likes it when people tell her how pretty she is. When mom needed some ideas for Christmas this year, I told her I wanted Grace to have an Elsa costume (from the Disney movie Frozen) that she could wear when we go see Frozen on Ice in February. And that was exactly one of the things Grace opened on Christmas. Last week, we saw an ad in the paper for a "princess for a day" fundraiser for Stamp Out Cancer. For a donation to the MCCA, little girls could have their hair done and nails painted, and even get to meet Queen Elsa. While we knew Grace wouldn't like having her hair done, we thought it would be fun to dress her up in her Elsa costume and get her photo taken, especially since it was for such a great cause. And Grace had big smiles for everyone there, and she loved when people stopped to tell her she was a beautiful princess. 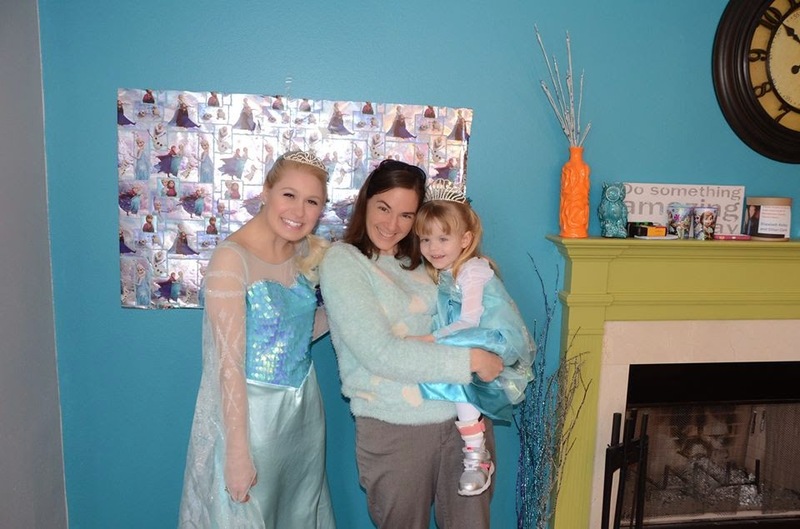 Grace got to try out her new princess crown and her Elsa costume when she met Queen Elsa in Litchfield over the weekend. Did I mention that Grace even has her very OWN princess crown? A friend of mine from Indiana sent her this tiara, that she won in a pageant years ago. She mailed it to Grace so she could have a princess crown of her own. It's such a sweet gift, and one we will always treasure. Our Grace sure is one lucky little princess. She is a very lucky little girl to have you and Kyle. I always knew you would be great parents. She is a ray of sunshine to all who meet her. God sent you a real blessing and we are proud to be part of her life as well.